Dagabaaz Re thankfully has RFAK singing it in lower pitch. Along with Shreya, the song has sweet conversation between Chulbul and Bulbul. This one I loved instantly. Pandeyjee Siti is made just for Bhai, as we can see in the video, sounds average at first, but repeated listens makes it fun with all the mish-mash lyrics. Fevicol Se is publicized as next Munni - but I don't think it will go that big. Brand placement works best with funny lyrics, not bad this Mamta Sharma's track is. It feels good to hear Sonu Nigam next, in Saanso Ne. A duet with Tulsi Kumar (ewww, she ruins the song), a fine flashback to 90s. A prelude that is almost identical to Chale Chalo, Dabangg Reloaded is a mix of Singham+Hud Hud Dabangg, is an okay one, sung by Sukhwinder. Will work best on screen. When I read somewhere that Sajid-Wajid and Arbaaz Khan together, took only 2 hours to finalize the music, I had prepared my mind for another tacky album, but Dabangg 2 gave me a surprise. Though with all the tried tested formula tunes - it works perfectly for this masala sequel. Sheer white snow, and the lady in red runs towards a church while our hero watches her without a blink - and so is the audience, feeling the magic of the maestro - Yash Chopra. The very first few frames give the viewer hint about how this three hour long feat is going to be - a typical, Yash mush, as already hinted in promos. That said, Jab Tak Hai Jaan, Yashji's last offering works best if you are a fan of his fairy-tale romance, SRK's charm and the frames devoted to beauty - be it nature or his heroines. Initially, I wasn't too excited for JTHJ from the start. May be its because I did not liked YC's last Veer Zaara, or maybe its because of JTHJ's above average music. But still, somewhere I knew YashSRK can't go wrong. So here's my short take on what I liked and what not. 1. Those trademark Yash Chopra moments. Be it the introduction of the leading actress*, or the song picturisations** or the masterful lovey-dovey moments. 2. Guest appearance of the Kapoors. Oh, how charming both of them are. 5. Cinematography. There is no looking back when it comes to a Yash Chopra flick. Each frame is a masterpiece. Each shot is picture perfect. No? 6. The end credits. Moved me. 1. Script? Whats with this department. I mean, come'on Adi, you could've done better job finding loopholes that even an average viewer can. For a 3 hour long flick, its a necessity. I didn't have any issues with fairy-tale like 'promise made to God', 'bad omen' things. But at least, something better as twist in the tale? 2. Music. Have already said out a lot about it in my music review, so nothing much to say about it. But really, its a lost opportunity. **3. As said earlier, picturisations of songs are good, except Heer and Ishq Shava. First stanza of Heer is wasted, playing in background of faltu scenes. And Ishq Shava clearly shouted 'I need 'dancing stars, please'. 4. Akira - taking her role quite seriously. And goes motor-mouth every now and then. Even while defusing a bomb, and shelling out a vocal bombardment over Major Samar, commenting on his ladylove. Surprisingly, the stubborn major doesn't get annoyed at personal remark, instead, LOLing at that. *5. What's with that 'logic less' swimsuit entry of Akira? Adi-are you the culprit? Well, there, one of the biggest release leaves mixed feeling. Swan song of Yash Chopra, leaves us longing for more, actually. This was the first time ever that I was reading something about finance. A subject that bores me to death. But the way the author Ravi Subramanian weaves a thriller around the on-goings of a bank, The Bankster gets you hooked to the otherwise boring world of white collar world of bankers. But not that efficiently as a riveting thriller should. The Bankster is about a bank that is headquartered at Mumbai. Its about a nuclear plant in Kerala. And also, about dark business of blood diamonds in Angola. Sounds interesting isn't it? Ditto, was my feeling when I read the summary on back cover of the book. (Thank You for signed copy, dear author). I was curious about how the three tracks are mixed up together. In return, I came a bit disappointed. The opening chapter, set in Angola, creates a different world, a storyline, that hardly features, or even has traces of it throughout the book. And that leaves you wondering why this certain character was introduced in very first place. Next one, track of a nuclear plant in Kerala, is again, makes the pace suffer featuring in between the main story that happens largely at Greater Boston Global Bank and its headquarters. The main track that involves life of many characters working in the GB2 bank, is absolutely interesting. Of course, being an ex-banker, the writer excels in his comfort zone. Portraying each little details of bank processes, fraudulent consequences, underground movements or even cut-throat competition in the office itself. Everything keeps you glued to the story. Though sometimes, Ravi's love for detailed description mars the interest of reader. Like in one chapter, he goes so deep portraying a day in a life of a fisherman, and that is so detailed that even goes in depth geographical details of Thane creek. Not giving out the spoilers, but one major action sequence that is so close to finale, gets too dragged while the character making puzzles to his counterpart about what he found out. But again, the track where two characters are introduced who through investigations of all the wrong-happening with the bank is pretty well executed. Amalgamation of these three tracks into one, towards the finale, is a perfect one though. But it did not give me 'big shock' moment with its revelations. Maybe its because everything got a bit stretched (maybe its just me). Final words? Well, business of Banking, where integrity and trust matters the most what happens behind those shining glass doors, reading about it, is a ride for sure. 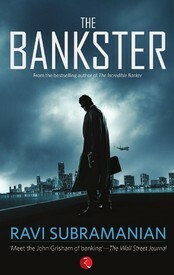 I would say The Bankster is an engaging read as far as the main story line goes by. Given if it is cut by a few pages, it could have been an absolutely gripping affair. But would recommend it for the variety it offers. You already have heard this magical track on MTV Unplugged. From Maniratnam's upcoming movie Kadal. Now this comes via fellow Rahmaniac @madhavanrajan . Thanks a lot man. Lets hear about the song and its translation in his own words. The song is about a girl who has fallen in love but unable to express her love to her lover. The song is composed based on the lyrics from an existing poem from Vairamuthu's collections. The poem has a very good use of rhyme and alliteration. Thus, the words rhyme well in Tamil. I don’t know in which direction my day rose? You threw an innocent look at me! And an authority that controls even Elephants and Tigers! I haven’t even swallowed my saliva! Which couldn’t make any sound!